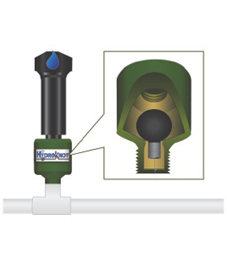 HydroKnot is the automatic shut-off valve that kicks into action as soon as a water flow spike is detected. It's an easy-to-install, permanent addition to your system that will likely pay for itself after just one stopped geyser. Depending on the size and usage patterns of your property, damaged or broken sprinkler heads may go unnoticed or undiscovered for weeks. In the meantime, hundreds or even thousands of gallons of water may be wasted. Think of HydroKnot as your silent “security alarm” that both protects your environment and prevents water bills that never should have happened. How Much Water Does a Small Leak Waste? A ½” sprinkler pipe can flow 13 to 16 Gallons per Minute (GPM) when a sprinkler head or riser breaks. If a sprinkler or riser is left unrepaired, it will waste about 7800 Gallons in just a month of typical watering. Find out how much your system could potentially cost you by using our Water Loss Calculator.